IMPORTANT NOTICE: FROM NEXT 1ST OF JUNE WE'LL BE INTRODUCING THE TOURIST TAX. 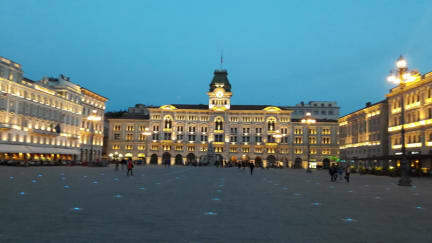 A new modernized style and fully equipped tourist house in Trieste's centre. This is Casa Vacanze Molino8, located nearby all interesting city places including beaches and historical and cultural amenities, 20 minutes walking from Train Station (5 minutes driving). We offer 2 beds and the chance to add 2 more beds following customers' requests. Our apartment is equipped with air conditioning, heating system, kitchen, fridge and freezer, toilet and shower facility, 2 rooms, 2 balconies from where you can enjoy an amazing view from San Giusto Hill and Montuzza Friars' Church to Miramare Castle, passing through a wide view of the town and the hill that crowns the built up area. TV and WiFi are free of charge. This place fits people who are looking to feel the merge of a high level flat part of the town skyline with the emotions of knowing a town district by a walking distance. The place is close to bars, restaurants, supermarkets and banks. It is well connected with public transportation system as well as private lines to and from Slovenia and Croatia, as well as highway network to Venice, Udine, Milan, Slovenia, Austria and Croatia. Check in from 15.00 until 20.00 excepting different agreements. Everything was on high level! Wonderful place, very nice and helpful people, great location. We will be back for sure. This is actually an apartment on the 5th floor of a building, not a hostel. There is an elevator. It was really really nice. The owners are punctual, kind, and generous. Tell them an accurate arrival and departure time so they can meet you for the keys. The bed is really comfortable, the shower and kitchen are great and they leave you some breakfast snacks. Location is good, right by a bus stop, but I mostly walked everywhere anyway. Air conditioning and wi-fi work perfectly.